This illustration indicates typical tiresymbols. 1. Tire size—For details, see “Tiresize” on page 338. 2. DOT and Tire IdentificationNumber (TIN)—For details, see“DOT and Tire Identification Number(TIN)” on page 337. 3. Location of tread wear indicators—For details, see “Checkingand replacing tires” on page 411. 4. Tire ply composition and materials—Plies mean a layer of rubber−coated parallel cords. Cords meanthe strands forming the plies in thetire. 5. Summer tire or all seasontire—An all season tire has “M+S”on the sidewall. A tire not markedwith “M+S” is a summer tire. 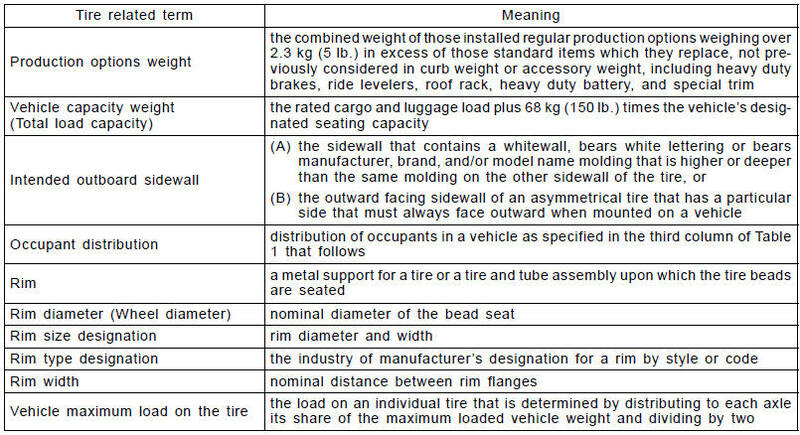 Fordetails, see “Types of tires” onpage 347. 6. Radial tires or bias−ply tires—Aradial tire has “RADIAL” on thesidewall. The tire not marked with“RADIAL” is a bias−ply tire. 7. “TUBELESS” or “TUBE TYPE”—A tubeless tire does not have atube inside the tire and air is directlyfilled in the tire. A tube type tirehas a tube inside the tire and thetube maintains the air pressure. 8. Load limit at maximum cold tireinflation pressure—For details,see “Checking and replacing tires”on page 411. 9. Maximum cold tire inflationpressure—This means the pressureto which a tire may be inflated.For recommended cold tireinflation pressure, see “Tires” onpage 434. 10. Uniform tire quality grading—For details, see “Uniform tire qualitygrading” that follows. 1. “TEMPORARY USE ONLY”—Acompact spare tire is identified bythe phrase “TEMPORARY USEONLY” molded into its sidewall.This tire is designed for temporaryemergency use only. For details,see “Compact spare tire” on page366. 2. Tire size—For details, see “Tiresize” on page 338. 3. DOT and Tire IdentificationNumber (TIN)—For details, see“DOT and Tire Identification Number(TIN)” on page 337. 4. Location of tread wear indicators—For details, see “Checkingand replacing tires” on page 411. 5. Load limit at maximum cold tireinflation pressure—For details,see “Checking and replacing tires”on page 411. 6. Maximum cold tire inflationpressure—This means the pressureto which a tire may be inflated.For recommended cold tireinflation pressure, see “Tires” onpage 434. 7. Tire ply composition and materials—Plies mean a layer of rubber−coated parallel cords. Cords meanthe strands forming the plies in thetire. 8. “TUBELESS” or “TUBE TYPE”—A tubeless tire does not have atube inside the tire and air is directlyfilled in the tire. A tube type tirehas a tube inside the tire and thetube maintains the air pressure. 9. Radial tires or bias−ply tires—Aradial tire has “RADIAL” on thesidewall. The tire not marked with“RADIAL” is a bias−ply tire. This illustration indicates typical DOTand Tire Identification Number (TIN). The “DOT” symbol certifies that thetire conforms to applicable FederalMotor Vehicle Safety Standards. This illustration indicates typical tiresize. This information has been preparedin accordance with regulations issuedby the National Highway Traffic SafetyAdministration of the U.S. Departmentof Transportation. It providesthe purchasers and/or prospectivepurchasers of Toyota vehicles with informationon uniform tire quality grading. Your Toyota dealer will help answerany questions you may have as youread this information. DOT quality grades—All passengercar tires must conform to FederalSafety Requirements in addition tothese grades. Quality grades canbe found where applicable on thetire sidewall between tread shoulderand maximum section width.For example: Treadwear 200 TractionAA Temperature A.
Tread wear—The tread wear gradeis a comparative rating based on thewear rate of the tire when tested undercontrolled conditions on a specifiedgovernment test course. For example,a tire graded 150 would wearone and a half (1−1/2) times as wellon the government course as a tiregraded 100. The relative performanceof tires depends upon the actualconditions of their use, however, andmay depart significantly from thenorm due to variations in driving habits,service practices and differencesin road characteristics and climate. Traction AA, A, B, C—The tractiongrades, from highest to lowest, areAA, A, B, and C, and they representthe tire’s ability to stop on wet pavementas measured under controlledconditions on specified governmenttest surfaces of asphalt and concrete.A tire marked C may have poor tractionperformance. Warning: The traction grade assignedto this tire is based on braking(straight ahead) traction tests anddoes not include cornering (turning)traction. Temperature A, B, C—The temperaturegrades are A (the highest), B,and C, representing the tire’s resistanceto the generation of heat andits ability to dissipate heat whentested under controlled conditions ona specified indoor laboratory testwheel. Sustained high temperaturecan cause the material of the tire todegenerate and reduce tire life, andexcessive temperature can lead tosudden tire failure. The grade C correspondsto a level of performancewhich all passenger car tires mustmeet under the Federal Motor VehicleSafety Standard No. 109. Grades Band A represent higher levels of performanceon the laboratory test wheelthan the minimum required by law. Warning: The temperature grades forthis tire are established for a tire thatis properly inflated and not overloaded.Excessive speed, underinflation,or excessive loading, either separatelyor in combination, can causeheat buildup and possible tire failure.